For all the years that mobile gaming has been around, there are still a lot of publishers and developers who still don’t quite get the platform. I don’t mean to complain about that. After all, even games ported directly from consoles or PCs essentially untouched can add to the diversity of the overall software catalogue. But it sure is great when a developer makes something that feels perfectly tailored to mobile, and that’s just what Grumpyface Studios has been doing for the last several years. Their recent efforts with various Cartoon Network properties have been especially wonderful, and are some of the best licensed games on any platform lately. What’s even more remarkable is the spread of genres they’ve been trying out and succeeding with: inventive action games like Adventure Time Game Wizard ($4.99), light RPGs like Attack the Light – Steven Universe ($2.99), and hectic puzzle games like Powerpuff Girls – Flipped Out ($2.99). 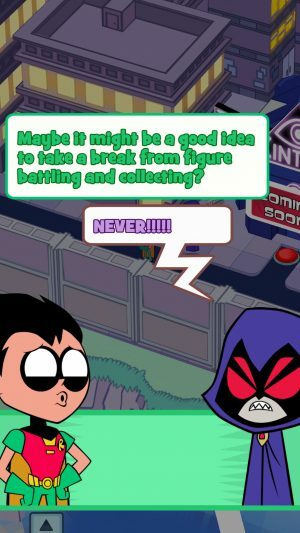 Teeny Titans ($3.99) marks Grumpyface’s return to the RPG genre. It comes at the genre from a slightly different angle than the Steven Universe game, but it’s equally approachable and even more enjoyable overall. While Attack the Light riffed on Nintendo’s Mario & Luigi games, Teeny Titans throws itself in the vague direction of Pokemon, challenging you to collect figures, level them up, and win all of the tournaments taking place in Jump City and beyond. Although they’re very different games, Teeny Titans shares a lot in common with Attack the Light, good and bad. Both games have excellent production values, simple yet compelling gameplay systems, and a streamlined approach to exploration. They’re also both a little on the short side and have some balancing issues. Neither of those things are enough to spoil the fun, but I really wanted this game to continue more than just about any other game I’ve played in recent months. 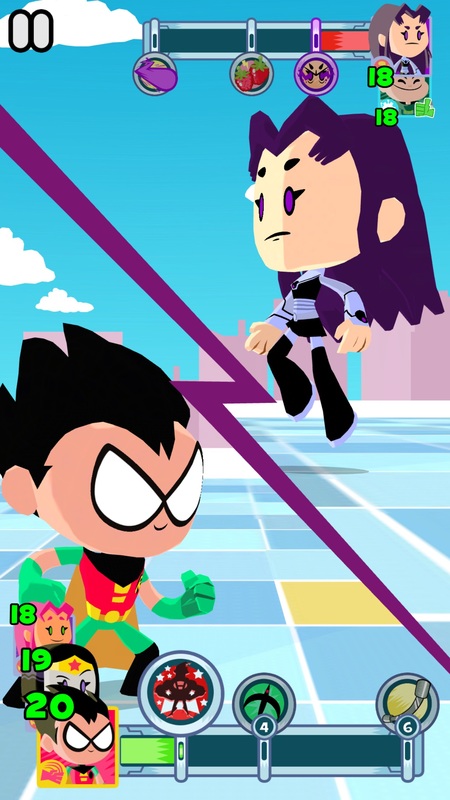 The game is of course based on Teen Titans Go!, the comedy-focused series of shorts featuring DC’s Teen Titans characters. The original Teen Titans animated series, while excellent, was already pretty far from the source in a lot of ways, and it’s safe to say that Teen Titans Go! has people even more split. One of the great things about Teeny Titans, though, is that no matter which camp of fans you’re from, the game has something for you. The fanservice in this game is pitch-perfect, with plenty of stuff that calls back to the comics, the original animated series, and even particular episodes of Teen Titans Go!. Since it matches the style of Go in both appearance and humor, however, you should expect a great deal of absurdity in general. That goes right down to the premise, which has the Titans going loopy over the latest toy craze sweeping Jump City. 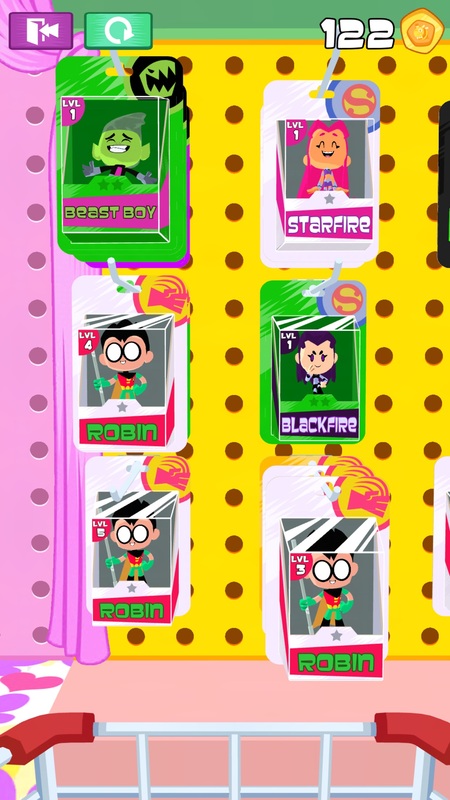 The Amiibo-like Teeny Titans figures are hotter than the sun, and just about everyone is obsessed with becoming the Teeny Titan champion, none more so than Robin, the game’s protagonist. You get a nice animated introduction that sets all of this up, with all of the voice actors from the series reprising their roles. Once you start the game, you’re given a few brief tutorials to show you how everything works before being tossed into the small but open world of Jump City’s downtown. As you progress in the game, more of the map will open up, giving you access to new shops and new Teeny Titan figures. Old shops will occasionally get in new stock, as well. You don’t need all 70 of the figures to beat the game, mind you. Even checking off all of the quests really only requires a handful. But as you watch that number climb up with each new acquisition, the obsession with filling out the entire roster slowly creeps in. Before long, you’ll find yourself flying into new shops like a maniac, frantically rifling through the selection to see if any new characters are hidden in the back somewhere. You’ll start buying every mystery figure pack in hopes of something new popping out. Oh, that’s just the start of your troubles, my friend. While you’ll spend a fair bit of time shopping and wandering around the city map, the meat of the game is in the battle system. Your party consists of up to six different figures, with the remainder going into storage where they can be retrieved at any time outside of battle. You can field up to three Teeny Titans in each battle, but only one member can act at a time. Switching between them mid-battle doesn’t cost you anything, so it’s safe to plan a strategy around flipping between them liberally if that’s what you’d like. Characters can belong to one of six different classes, with each one being strong against one class and weak against another. You’ll always be able to see which kinds of figures your opponent is bringing into battle, so it’s easy to take advantage of this system if you have a variety of figures leveled up. When the battle starts, you’ll have a split view showing you and your opponent. A bar fills up for each of you over time, giving you access to one of three different moves per character. Weaker attacks and buffs are usually set to the first slot where they can be used quickly and repeatedly, while stronger attacks and major buffs are often in the third slot, requiring nearly a full meter to use. The meter is shared among your whole team, as are most buffs and debuffs, adding a bit of extra strategy to an otherwise simple system. For example, you can build your team so that two of your characters have attack buffs in their first slots, with the third having a weak attack in that position. Buff once, switch, buff again, switch to the third and deal hefty strike. You’ll also want to keep an eye on the enemy’s meter, particularly if you’re using a move that can be interrupted. Sometimes it’s best to wait for them to hit you before you try to launch your own attack. As you win battles, you’ll earn experience points that are distributed among all of the Teeny Titans in your party whether they joined the battle or not. Like Attack the Light, when a character levels up, you’re asked to choose one of three bonuses, allowing you to customize your team to an extent. After you reach level 5 with a figure, you can feed it other figures to unlock more powerful versions of its three moves. You’ll get the best bang for your buck if you feed a figure copies of itself, so you’d better head back to those shops again to see if you can scrounge up an extra 1980s Starfire or two. You can also equip your figures with a mod chip, special enhancements that convey various benefits. These include basic things like stat boosts along with other more interesting effects such as starting battles with an active buff or giving you more money when you win fights. With all of these options combined with a 70-character roster, it’s quite unlikely that your end-game party will resemble anyone else’s. There’s a lot of depth here in theory. There are tons of characters, lots of ways to modify them, and even if they only have a few moves apiece, that still adds up to a lot of potential strategies. Like Pokemon, however, there’s considerable overlap in the skills, leaving class and starting stats as the main differentiating factors between many figures. As in Attack the Light, there are a couple of quick and easy battle strategies that essentially dominate the game. In this case, a character with an attack in the first slot and a mod chip that hastes your battle meter works as an instant win button for most of the game. Throw in a healer in case of emergencies and you’re set. It’s that old Cyan problem from Final Fantasy 6 ($14.99). Yes, the more advanced moves scale up in damage and usefulness appropriately, but it’s almost always a more effective tactic in the long run to spam low level attacks because of how long it takes to fill the meter. The Wonder Raven I got near the beginning of the game ended up carrying me through the entire thing. I sometimes used different characters for specific quests, but other than that, there was little reason to even swap characters mid-battle. The funny thing is, you probably won’t even care about the broken balance, particularly on your first run through the game. You’ll likely be too busy looking for secrets, hunting down figures, and soaking up sly references. And it’s not as though other party configurations aren’t viable. In fact, just about any party set-up is viable as long as they’re level-appropriate for the fight at hand. So if you want to roll a team entirely made up of different types of Beast Boy, go right on ahead. You’ll have fun. But if you know your way around RPGs pretty well and are looking for a challenge, you won’t find much bite here until very late in the game. That said, if questionable balancing and an overall light challenge bothered me that much, Final Fantasy 5 ($14.99) wouldn’t be one of my favorite RPGs, and we all know how I feel about that game. One way that Teeny Titans differs greatly from Attack the Light is in the stuff that happens outside of battles. In that game, the battle system had to carry the whole works, because the dungeon exploration was deliberately streamlined to make it swipe-friendly. 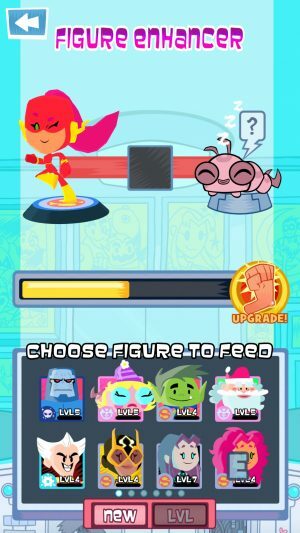 Teeny Titans gives you a ton of things to do outside of fights. There are coins on the road to collect, shiny spots to search for cash or figures, a couple of mini-games, and quite a few scavenger hunts. Events will happen at regular intervals, challenging you to get to a certain location in exchange for a prize of some sort. Even the simple act of shopping is fun, since you can touch and interact with the packaged toys on the shelves. Figures are often shelved three or four deep, and the best ones are usually hidden at the back. Touching the packages and flinging them out of the way to get at the toys in behind is more fun than it really should be. As I mentioned before, the biggest bummer in Teeny Titans is how soon it ends. It’s a hard game to put down, which makes it feel like it flies by even faster. You’ll get a few days out of it at least, but when you finally nail down that 70th figure, it feels a bit like December 26th. Opening a ton of presents in a single day is totally awesome, but can’t we have a second day of opening a ton of presents? I guess it’s not the worst problem to have, but I sure hope this game gets a sequel or even a solid content update, because in spite of all it does, I can see potential for so much more. It’s hard to be too upset at what you get here for the asking price, however, particularly since it’s rare for games of this type to have no IAP whatsoever. Teeny Titans could have been a nasty and probably quite effective free-to-play money-cruncher, but I’m quite happy it took the road less-traveled. In spite of the balance issues and the fact that the darned thing ends, Teeny Titans is still one of my very favorite games of 2016. The timing of this game’s release is such that I had far more important things to be doing during the last few days, yet I still couldn’t stop playing this game until I had done just about everything in it. I have no idea which genre Grumpyface will take on with their next game, but if they keep turning out fine efforts like this one, I hope they’ll be swinging back around to RPG-ville before too long.